I shot this image while strolling through Genoa’s historic Old Town during my recent vacation in Italy. Below is the original photograph. I was carrying my Olympus PEN-F with my Oly mZuiko 14-150mm F4.0-5.6 Travel Zoom attached. 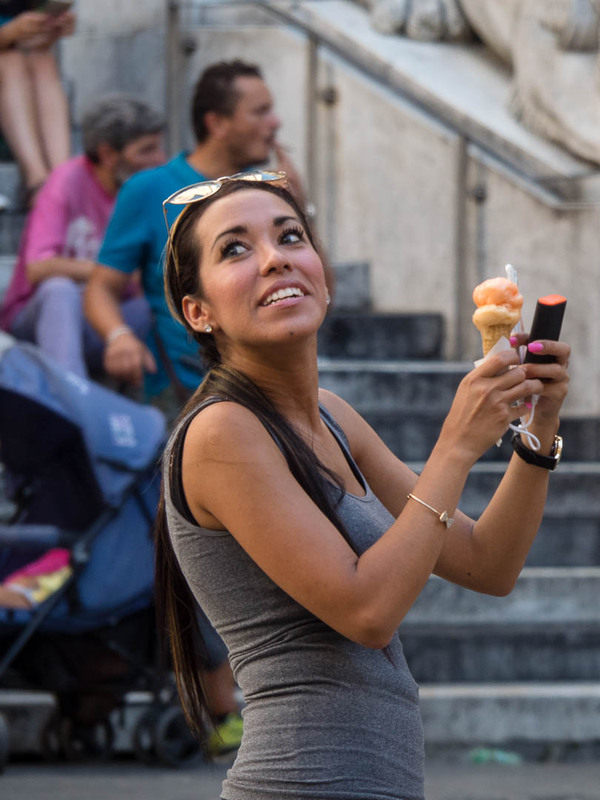 When entering Piazza San Lorenzo in front of the Duomo San Lorenzo (a magnificent medieval cathedral by the way) this smiling girl with ice cream in one hand and her mobile phone in the other immediately caught my eye. I loved the vibrance of her smile that radiated summer fun. So I brought the camera to my eye, Zoom already at the far end at 150mm which equals to 300mm equivalent in full frame, and pressed the shutter. It was a more or less automatic move. A split second later the moment would have been lost. When looking at the image in Lightroom I immediately liked it. The girl with the summer smile was a keeper. But when looking at it in more detail I thought the right side of the image contains too much clutter that I somehow found distracting. So I went for a crop, isolating the girl and converting the image from landscape to portrait orientation. The result you find below. I could have cropped tighter put I like the kind of juxtaposition of her head looking up and the blurred heads of the two other tourists looking right. That way I think also her gaze towards the upper left corner has more room, emphasizing the question at what she is looking at. Even if I would have shot the original image in portrait orientation, it would have had too much empty space around the girl anyway as I was already at the far end of my zoom range and if I would have continued to walk towards the scene the moment would have been lost. 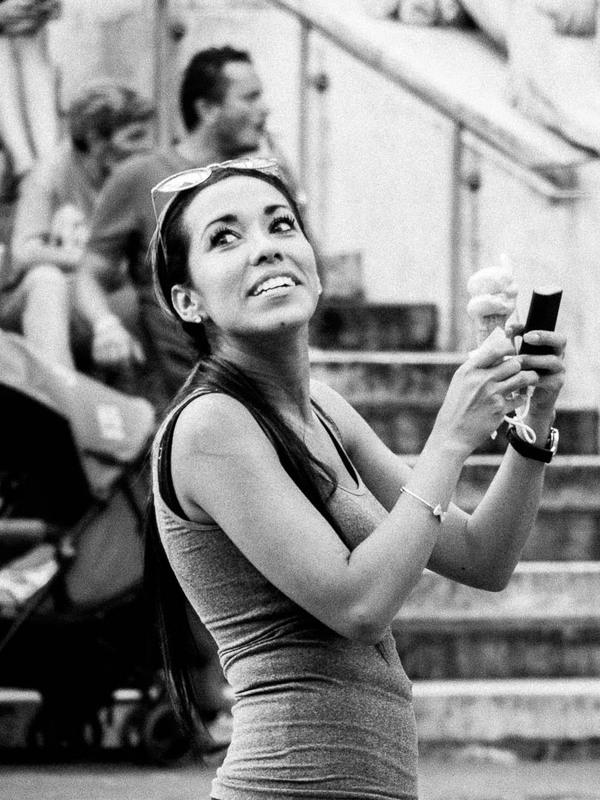 As you probably know, I shoot a lot of my Street Photographs either directly in Black&White or convert them to monochrome in Lightroom CC, at least those where the colors in the image don’t contribute to the story of the photograph, which in this case I don’t think is the case, although you might argue that the tones of her suntanned skin add to the summer feeling. Below you find the two versions side by side. In my opinion in the B&W version she pops out much more than in the color image, especially her eyes. And I feel it gives the image a more timeless feeling. But of course this is just my opinion. I would love what you think about those conversions, first cropping and then monochrome conversion. You have all images here in this post. Feel free to comment! Mir gefällt das B&W Bild mit dem grossen Korn am besten. Auch, wenn dieses vermutlich hineingerechnet ist. Die Reduktion auf die Graustufen heben den Gesichtsausdruck der Frau gut hervor. I’m thinking of grabbing a Canon 5DsR and eventually a medium format because I love cropping. I don’t always crop besides eliminating crap at the edges. You can do such amazing things with a medium format…would love to own and master one…but hey, everyone needs to have goals 😉. Thanks for visiting! Very interesting thought process and image. Black and white is definitely the right way to go with wonderful capture. It provides a timeless feeling where only her clothing and phone date provide a time frame. I would tend to respectfully disagree with some of the other commenters and advocate against vignetting and over blurring out the background. 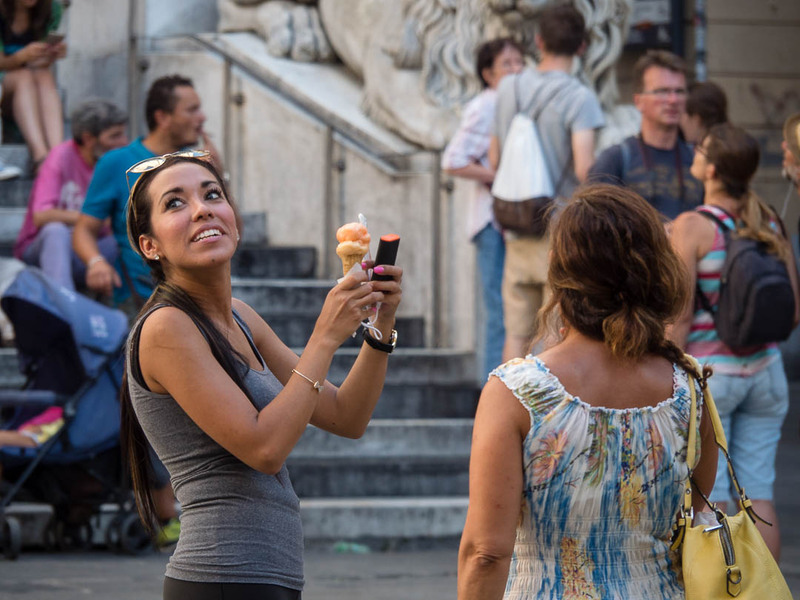 This is a street photograph and not a street portrait that is intentionally set up. Street photography capture innocent moments in the midst of life. Sort of moments within moments. While the other people are distracting on one hand, they are part of the scene and make it more real. If you do anything with this photograph, just so a tiny more blurring of the background people. thanks so much for the awesome feedback. Actually I went back to the image and experiment a bit with vignetting and additional blurring, but felt it did not add to the image, so I left is as it is. I like your statement about street photography capturing “moments within moments”. I think this is the essence of this genre, each moment is totally unique and thus we capture an irretrievable snapshot in time. Thanks for visiting and commenting! Ich kommentiere mal auf Deutsch (das Englische kann ich ganz gut verstehen, aber es zu Schreiben ist mir nicht so geläufig): Es kommt darauf an, was man betonen will. Ich finde das Foto auch unbeschnitten gut, da es die junge Frau zeigt, wie sie in der Menschenmenge einen ganz besonderen Moment erlebt. Das ist ja auch eine spezielle Situation. There’s too many people out there telling us what are the rights and wrongs in street photography! Tanks, really appreciate your comment! In the end, we are the artists and more than ansthing else our images need to please us! There’s nothing intrinsically wrong with cropping ‘street’ shots, so long as you don’t misrepresent the scene or subject. I like this shot but find the background to be somewhat distracting.